This Boot Camp is a Lifetime Membership…meaning that once you join, you can do the Boot Camp over and over again for FREE! My name is Brandi Rollins and I am creator of Raw Foods on a Budget and the Health on a Budget Summit. I have been helping people all over the world save money while eating a raw foods diet, and now it is time that I help you! Eating a delicious, affordable, and sustainable raw foods diet has less to do with the price of food, and more to do with how you buy food, your relationship to food and your budget, where you buy food, and how you prepare food. 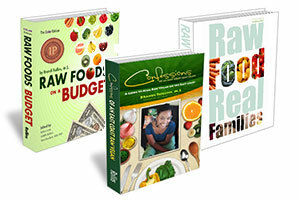 I designed my ONLINE Boot Camp to give you all the tools you need to THRIVE on a budget-loving raw foods lifestyle. It doesn’t matter if you are 100% raw, high raw, or raw friendly, my program will show you how to eat healthy while on a budget. I designed this 192-page workbook to contain everything you need to keep you on track including daily affirmations, articles, food and exercise logs, journaling space, and activities. 500+ pages of Raw Food Content! As a Boot Camper, you will get access to my 3 e-Books containing over 200 recipes, raw food strategies, and uplifting stories about transitioning to raw foods. A private Facebook group where Boot Campers can ask questions, share recipes + experiences, and connect with me and other Boot Campers. 9 Menu Plans + Shopping Lists When starting out on a Raw Foods diet, having good-tasting recipes, menu plans, and shopping lists is KING! This is why I give you access to 9 different delicious, affordable, and in-season menu plans. BOOT CAMP Workbook (preview) I designed this 192-page workbook to contain everything you need to keep you on track including daily affirmations, articles, food and exercise logs, journaling space, and activities. 500+ pages of Raw Food Content! As a Boot Camper, you will get access to my 3 e-Books containing over 200 recipes, raw food strategies, and uplifting stories about transitioning to raw foods. Daily Affirmations + Emails For motivation and additional support, you will receive emails containing daily affirmations and topics of the day. Community Facebook Group A private Facebook group where Boot Campers can ask questions, share recipes + experiences, and connect with me and other Boot Campers. Weekly Group Support Meetings Join us for weekly group support meetings on your phone or online (via Facebook). Get your questions asked, the support you need, and connect with other Boot Campers. Once again loving this round of the Boot Camp! I tell everyone I know about you and your program. Because of you, I’ve become more adventurous. 100% raw? No. BUT definitely more than ever. I tried ramps for the first time and thought of you. Just wanted you to know you helped change my life and my eating habits…for the better! Thank you. I was diagnosed with breast cancer in 2015. I went raw for over a year because I had researched. I am about 90% raw now and I want to be 100% raw. My weakness is bread and soup. I make some adequate raw bread and the same with soup. I attended a raw food event about a month ago and they served a fair soup. I go long periods of time without bread and then it calls my name. I am a good baker and I am in a line of good bakers on both sides of my family. Bread is my thing; flax crackers are ok. I am grateful to be alive and in good health. I needed recipes that were both easy to make and on a budget. Brandi’s work has helped me to make the change easier and more cost effective. I felt like I had hit the jackpot when I found Raw on a Budget. I am so thankful for Brandi’s work and I think anyone who is starting out on a raw diet should buy this book. Every time I feel I need a reset in my life regarding food I go back to Brandi and her Raw Foods on a Budget plan. It is what got me eating raw 5 years ago and it is what I am comfortable with after all of these years. I am not nor have I ever been 100% raw but I have learned that I can eat mostly raw and feel fantastic. Brandi’s recipes are healthful, easy and delicious! It’s for good this time! So my friend Brandy Heyward, who now is a Vegan Chef, encouraged me a couple years ago to do the challenge with you. I found the recipes easy to follow and the shopping list incredibly helpful. While I didn’t convert to total veganism, I found it provided a means for me to incorporate more of the vegan lifestyle in my diet. So I learned some things, like, peel the bananas BEFORE you freeze them. 🙂 But the best benefit, was when I had my annual checkup, my cholesterol numbers went down and my Doctor was very pleased. I went back to my old ways of eating and most recently my numbers were up to the point where they were looking at putting me on a statin drug, but I was still borderline. I refused to go on a drug and am going back on the Book Camp to get my health back. Because of the Boot Camp I got used to having collard and kale smoothies for breakfast and I make my lunches at work, so my students and co-workers see me massaging my kale and yeast and onions in my raw salads and get to sample my yummy foods. I keep a copy of your recipes in the drawer at work so I can pull them out when I make my breakfast and lunch. I’m excited to be back on the program and it will be for good this time! It has been said “to be a success you must find a need and fill it”. Brandi has done just that! I am so blessed to have found the wisdom & practical advice, given in abundance, in this book. As a disabled person on a tight budget and new to the raw food lifestyle, this is just what i needed to show me the way to raw food success. Thanks, bandi, for not keeping this amazing information to yourself!!! Brandi has written a book that takes all the guess work out of healthy eating for you. All the way through the smarter planning of your meals, to the shopping, preparing, and storing of your produce, to the fine print of start up costs and appliances or other tools you may need to have in your kitchen for a more raw food based lifestyle. Brandi not only shows you how to shop and get healthy food on a budget she also has a plethora of delicious recipes with beautiful photography that captures the quality of her dishes. Brandi has put her heart, time, and love into this book and it’s evident through her thoroughness and meticulous efforts to show anyone wanting to incorporate a raw food lifestyle how to do it. From the beginner to the expert this is a must have book in your kitchen for anyone who wants to eat more raw foods, have a healthier option for meals, and stay on a budget at the same time. Brandi is a gem amongst raw food culinary artists and her book is bound to be a friend you refer back to again and again! I am new to eating Raw Food; however, since joining the camp and group, my eyes have been open to a whole new world of eating and food preparation. Thanks Brandi!!! Fortunately, over the past 7 years of running raw food online programs, I have had very few refunds. If for any reason you're not thrilled, you can contact me at any time within the next 7 days for a 100% refund. My email is brandi[at]rawfoodsonabudget[dot]com. This is my direct personal email address. Please note that I am a small business and practically all of the income that comes through my programs is spent on maintaining the business and website. So please make sure that you are ready to commit before purchasing the program. I am all about helping people to save money and as long as you put in the effort, you will see savings! Choose Your Boot Camp Package! Plus, you will have full access to upcoming and future 28 Day sessions FOREVER! So when you sign up for the March session, you also sign up for the April session! I like to create menu plans that are accessible to most people, so I keep the recipes simple yet interesting. Overall, the menu plans require a knife, cutting board, and a basic blender and food processor (mini to large). That's it! You don't need a dehydrator or high-speed blender like a Vitamix (TM). When it comes to a blender, all you really need is one with a sharp blade. If you have had your blender for many...many years, you may want to replace the blade (otherwise it may just spin the food around). When it comes to a food processor, try to borrow one from a friend or family member. Many people have food processors and don't use them...in fact, I got my food processor from my auntie! A mini food processor will also work, but you will have to split many of the recipes in half to make sure they blend correctly. After your purchase, you will receive a confirmation email containing a link to download the Boot Camp materials. It is IMPORTANT that you download all of the materials (i.e., Boot Camp introduction, ebooks, menu plans, audio recordings) onto your computer so that you can retrieve them during the Boot Camp. Note that you do not need to login at www.rawfoodsonabudget.com to access the Boot Camp materials (as it says in the Boot camp workbook). Because this is an intensive bootcamp, I want to offer people an opportunity to get a head start on the program's curriculum and activities before the program actually starts. The activities in Early Start phase is more spread out than in the bootcamp (which makes it easy to start) and consists of daily emails containing activities and audio recordings of interviews and talks. Participants are automatically enrolled into the Early Start Phase if they enroll at least four days before the bootcamp start date; however, the earlier you enroll, the more you can take advantage of this phase. I highly recommend that people enroll early to take advantage of this phase! So far, the feedback on this component of the program has been great, so I am sure you will love it! A 100% YES! All Stars get everything that I offer online for FREE! This includes programs, ebooks, the Health on a Budget Summit, and webinars. For more information on the All Star program, go here: www.rawfoodsonabudget.com/allstar. If you are All Star, I send periodic emails to All Stars containing All Star freebies and specials, so please check your email for instructions on how to register for this program. Remember that you receive lifetime access to this program. If you have any trouble, shoot me an email: brandi[at]rawfoodsonabudget[dot]com. Everyone who purchases the 28 Day program gets access to the current and upcoming sessions of this program forever. Before each session, I send an email to all previous 28 Day registrants with details on how to register for the upcoming session. So please check your email for instructions on how to register. If you have any trouble or did not receive the email, contact me at brandi[at]rawfoodsonabudget[dot]com. Hi Brandi, are you still offering this course? I wanted to purchase it awhile back and did not have the funds? Are you doing another boot camp soon? Sorry I missed the October ones. Hi Brandi, I am all over the place, I ordered another program that I was going to start but I really feel that your program resonates with me at this time, I already have your Raw Foods on a Budget book so I’m thinking to sign up for your boot camp starter pack, I have many books but need to really start and stay consistent.